Note: If you don't have a WebReserv.com account already, please click here to create your free account. 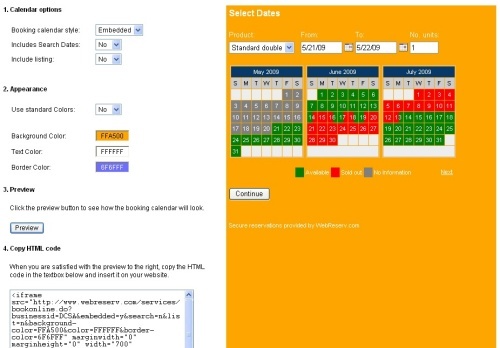 The booking calendar is most often used together with the business listing on WebReserv.com. Having your business listed multiple places greatly enhances visibility to the marketplace and helps you to get more customers. The booking calendar can also be used for businesses that do not need a business listing on WebReserv.com. For more information about this usage, please contact your WebReserv Support team. To add the booking calendar to your website, log on to your WebReserv account and go to Website - Booking Calendar. 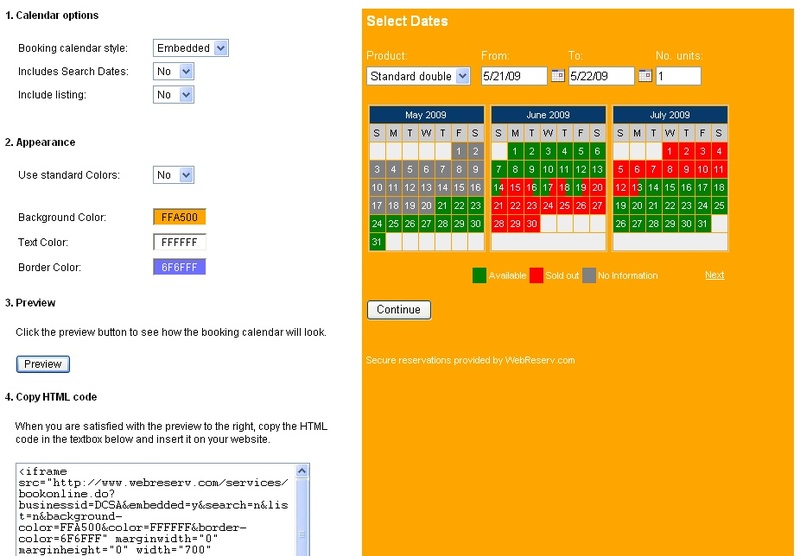 On the booking calendar page you can specify how the booking calendar will look on your website. The different options are detailed below. 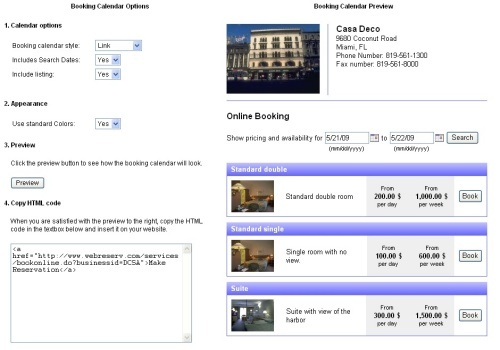 Style: Specifies how you want the booking calendar to appear on your website. You can choose between Link (default), Embedded or Button. The Link and Embedded options are the two most popular methods. With the link method, you'll get a link that you can add to your existing website. When a user clicks the link on your website, the user will be forwarded to the booking calendar where the availability can be viewed and reservation(s) can be made. 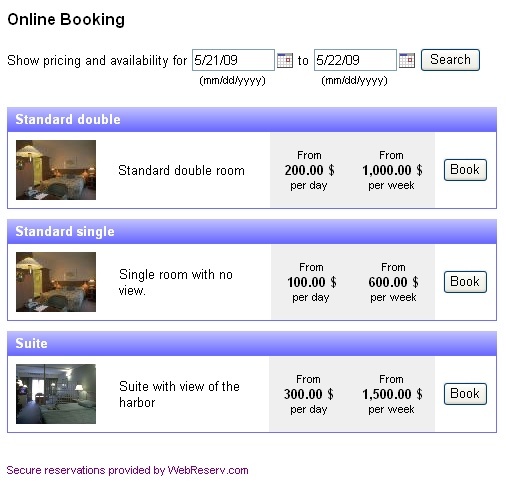 The button works in the same way, except that the user will see a booking button instead of a booking link. The embedded option is slightly different. With the embedded option, the user will stay on your website, but will see the booking calendar inside your website. There is also a difference in what is shown in the booking calendar: when the booking calendar is opened with a button or a link, it will have a header with your business name, address, contact information and a link back to the website. 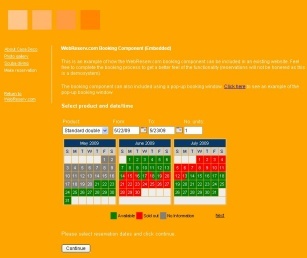 The embedded calendar does not show the business information as this information usually is shown on the website. Include Search Dates: If this option (and include listing) is set to yes, the customer will be able to search for a specific date range to view availability and rates across all your products. Note: Include search dates has no effect if include listing is set to no. Include Listing: If this option is set to yes, the customer will see a list of all products/units/activities/tours. If it is set to no, the booking calendar will not show a list of products, but will instead show a detailed reservation calendar. After selecting the style of your booking calendar, click the preview button and a preview will be shown on the right side of the screen. If necessary, you can change the options and click preview again to see how different settings affect the booking calendar. 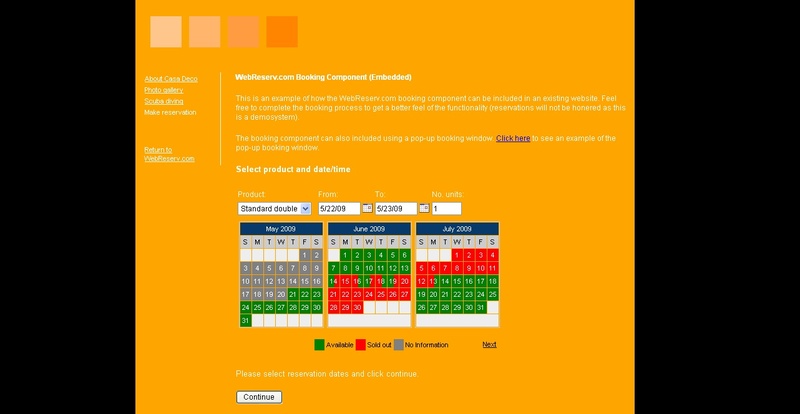 In many cases you'll want to have a booking calendar that uses the same colors as your website. 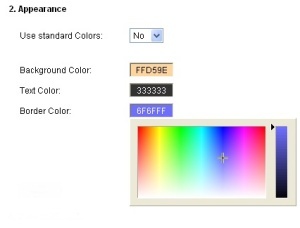 To customize the colors, select no to Use standard colors. You can customize three types of colors in the booking calendar: the text color, the background color and the border color. To change a color, simply click the corresponding color field and pick the color from the color selector. If you know the RGB code (hex) you can also enter this directly in the color field. After changing the colors, simply click the preview button again to refresh the preview on the right side. When you are done customizing the booking calendar, copy the HTML code from the code window on the left side of the screen and paste the HTML code into your website editor at the place where you want the link, button or calendar. Congratulations - you have now completed the booking calendar customization and setup process. In addition to colors and fonts, you can also control what product (or room/tour/unit) should be shown and selected as the default product in the list. You can find the productid for any product by logging on to the Administration module, and select Setup - Product & reservation rules. The productid (ptid) is shown in the website address bar when a product is selected. For businesses with two or more business locations (or properties) it is often desired to use the booking calendar for all locations (or properties). This can easily be accomplished with WebReserv.com. If each location is shown on a different webpage, simply add the booking calendar to each webpage with the businessid parameter for that particular location. Adding multiple businessid's to the URL will cause the booking calendar to show a drop-down list with each location next to the product selection list. (Note: activation of the drop-down list may be required. Please contact WebReserv.com support for more information). language Controls what language will be shown. showrates Controls how many rate columns to display in the product list. Valid values are 0 - 10. Set to zero to remove the rate columns from the product list. auto (default). 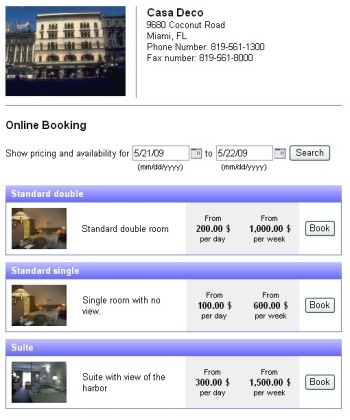 Displays a regular booking calendar. Switches to narrow mode if multiple date/time and persons fields are used. custom. 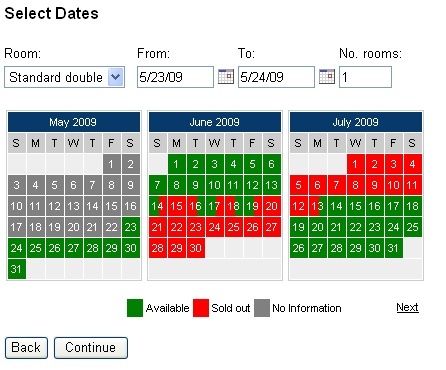 Instructs the system to use a custom developed booking calendar. narrow. Rearranges product, date, time and number of persons to span multiple lines. Recommended when the width of the booking calendar is 700 pixels or less. original. Original booking calendar setting. Does not re-arrange items. To get started with WebReserv.com and to get a booking calendar for your website click here.